The Washington Times, founded in 1982 by the Rev. 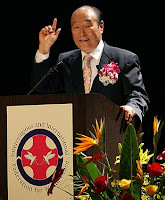 Sun Myung Moon, right, leader of the Unification Church, laid off more than 40 percent of its 170-member newsroom staff, including its top editor and scores of reporters, editors and photographers. At a staff meeting, employees were told to pick up packets that revealed their fates. Dismissal packets included notice that they would receive salary until Feb. 2, plus the amount of vacation pay they had earned for 2010. The Sports and Metro sections will cease to exist as stand-alone entities and layoffs in those sections neared 100 percent.